Description Of Item: Come one, come all ? the LITTLEST PET SHOP talent show is about to begin! 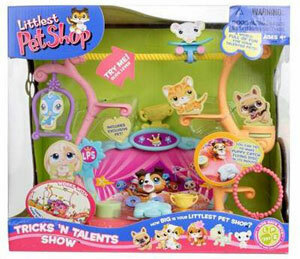 Now your pets can show off all their tricks and twirls, as they compete to win the first-place trophy. From down on the main stage to high up on the tightrope, this is one show you don?t want to miss! Place the puppy on the stage, then move the lever to make it ?run? from side to side! How many times can you get the puppy to catch the disc? Place the flying disc in the launcher, then pull back and release to let it ?fly!? Spin pets on the platform, or send them for a skateboard ?ride? on the tightrope! Who will win first prize? Place your most-talented pet on the podium to accept the trophy!